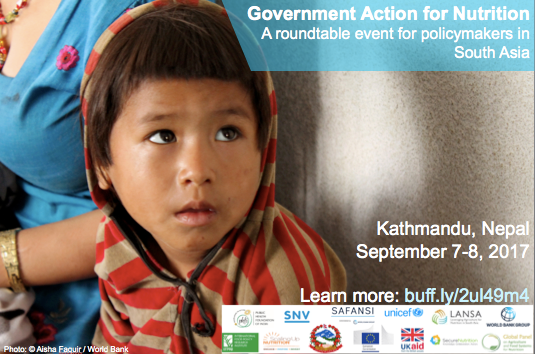 On 7 September 2017, the National Planning Commission (NPC) of Nepal hosted a two-day Roundtable focused on advancing multi-stakeholder and multi-sectoral national and subnational efforts for scaling up government nutrition programs. The event brought together 120 decision-makers and implementers from governments, civil society organizations, and donors to share their experience in designing and implementing programs that address malnutrition in the region. The event was sponsored by the South Asia Food and Nutrition Security Initiative (SAFANSI), and focused on advancing multi-stakeholder and multi-sectoral and subnational efforts for maximum impact. Discussions drew on the latest experiences from ongoing nutrition investments in the region to explore the practical challenges. achieving behavior change among communities. World Bank’s Acting Country Manager Roshan Darshan Bajracharya said that this was the first of a series of roundtables Through these events, SAFANSI is supporting regional government-led efforts towards more integrated food and nutrition security actions, working with existing knowledge networks to develop a strong cadre of advocates, policy-makers, and practitioners. The South Asia Food and Nutrition Security Initiative (SAFANSI) seeks to address how chronic malnutrition remains intractable despite high economic growth—by fostering the crosscutting actions that will lead to measurable improvements in food and nutrition security. SAFANSI is a multi-donor trust fund administered by the World Bank. As Trustee and Administrator, the World Bank is responsible for program development, implementation, and monitoring & evaluation. Phase II of SAFANSI is financed by DFID and the European Commission. SAFANSI funding can be used to finance activities in any of the countries of the South Asia Region (Afghanistan, Bangladesh, Bhutan, India, Maldives, Nepal, Pakistan and Sri Lanka) or regional activities, covering two or more SAR countries.